I also like how the seconds hand stops at 0/60 when power reserve goes to zero, wonder how they do that? It is a great feature and I’m sure was explained somewhere before but can anyone help enlighten me again? The seconds hand always stays at 0 when watch stops. Thanks for the endorsement, my friend 😬...I’ll wear it more since my boss seldom wears it. Others do this as well. From my memory I know the 1815 Up/Down does this as well. Essentially the watch has predicted it's own death! Thus hold, I remember a comment where "somebody" asked : why 27 YG ? Big congrats a choice of esthete. Lucky, it is true that with L&S,I have the green fingers ! I know it others so lucky, particular "pinch ear". And what to say about sublimate divers of certain one Am ico, divers.... and not that. The size looks perfect on you as well. And didn’t know you like purple too? 😉🤣 You are also of royal nobility. Lol. Ok. You must have liked purple enough to wear it. Visually it looks small on my wrist but on photos it’s just perfect so I wonder if I should trust my own eyes now 🤣 Thanks Kev. 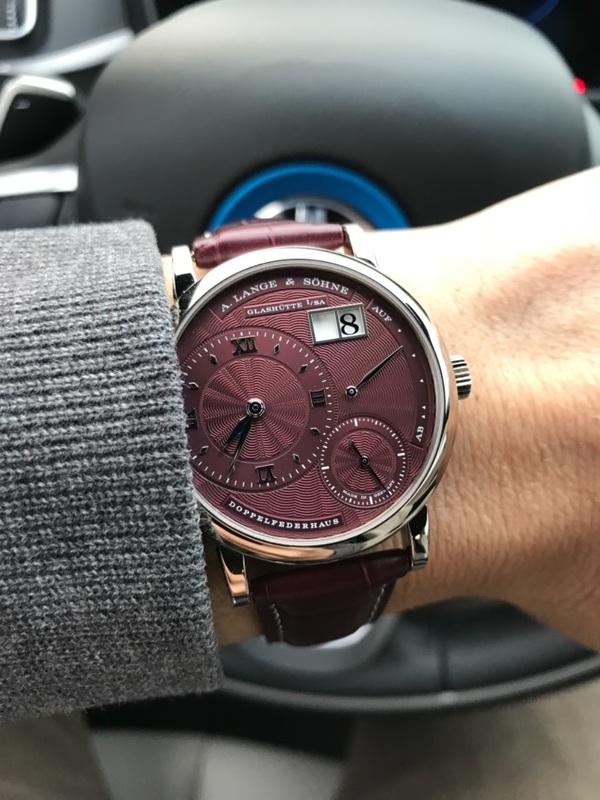 But that’s one great looking Lange, Raymond! Steal it and secure it. Just gIve your boss something blling so she wont realize the lost. most blogs just say it’s a “clever feature” and no technical explanation. Thank you ik2000. I think it is a neat feature, and next time I’ll pay attention to when the seconds hand will start moving after winding the watch. I think we can utilize this and yes, a zero reset will be better for setting the time. So that is not new to Lange, just not sure when or who have it first. I can wear watches from 36mm to 46mm, ideal for me is 39-41mm. Thanks sham1.